An inspiring historical visualization of Napoleon’s 1812 campaign (please click to see it). I have recently been trying to figure out good ways of representing large amounts of historical information in a way that makes sense to everybody who might stumble across my work! I think that a good graphic has the ability to draw readers into what we do, letting us convey the scope, joy, or horror of history without needing to read through often dense prose. In this post, I want to give a sense of what I think works, what doesn’t, and why we should start thinking about cool maps, graphs, and charts! What is arguably the finest historical visualization ever is at right. Charles Joseph Minard, a French engineer, produced this 1869 chart visualizing Napoleon’s 1812 Russian campaign. In this image, which I encourage you to click on to zoom in, you see how BIG the army is going into Russia, the path it took, where it had to begin retreating, just how few soldiers returned from the campaign, and the plummeting and wretched winter conditions along the path. Take a second, look at this chart. From this, you learn a great deal, and the human scale of suffering and tragedy can be captured in a way that a paragraph of text might not (at least to us visual learners). Why should we pay so much attention to how we make our graphics? Firstly, I think people learn in a variety of ways. Some can sit through a three-hour lecture with rapt attention, while others snooze. Some can read a 400-page book, devouring every nook and cranny, while others get bogged down. Still more draw inspiration from graphics, visual ways to see the past. But, perhaps we should leave it to Mark Howard Moss and his book Toward the Visualization of History: The Past as Image, who argues that “individuals access images more readily than words. Seeing is a central feature of modern soceity and as Mitchell Stevens cogently puts it, ‘Moving Images use our senses more effectively than do black lines of type stacked on white pages. '” Heck, think of chemical elements: chances are, your mind immediately flashes to a visualization, the Periodic Table of the Elements. From Canada: A National History, a top notch-history textbook! Thumbnail used for the purposes of critical analysis. Visualizations, as Minard’s map shows, have tremendous power (another famous one that had power at its time is of course John Snow’s map of contaminated wells and cholera outbreaks). For more, see “12 Great Visualizations that Made History.” But we can also do them very poorly. 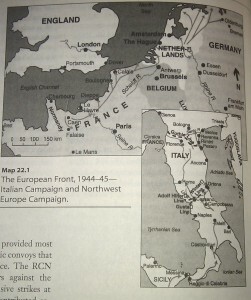 Flipping open a random Canadian history textbook, I am confronted with the visualization at left. Do we get the sense of the turmoil of the late Second World War? The flow of modern warfare, or the human suffering? One can read the prose, certainly, but the picture contributes little. To be fair, I’ve made my share of very poor visualizations (you can click here to see the worst one that I suspect a Canadian historian has ever made, as compared to a much clearer one here that really shows what I want it to), but I think that historians – if we want to be active, engage with the public, need to begin thinking about how to visualize information. 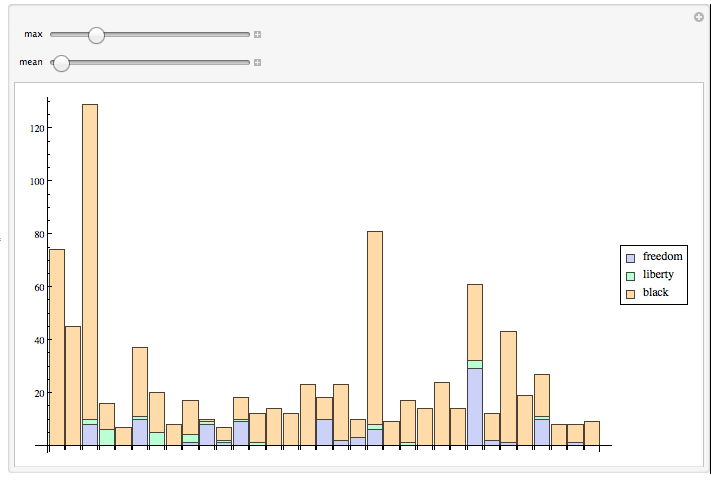 Popularize fun, easy ways to visualize information. Anybody with a computer can use ‘Wordle.’ They’re not perfect visualizations, BUT they are a lot of fun. When I’ve used them in presentations, people are really engaged. During my doctoral defence, handouts with a word cloud gave people a quick sense to see some of the themes, and encouraged deeper questions. As instructors, amateur historians, etc., why not start out simple with these ways forward? Teach it. If a great visualization is around, use it in a lecture or seminar. 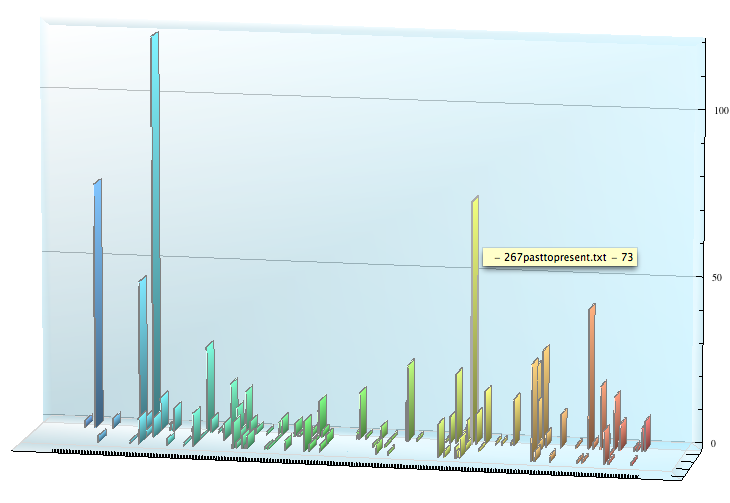 Of course, the problem is, there aren’t too many visualizations out there that we can immediately grab! But most importantly, just think about it. The power of images, the ability to draw people in, to make connections that you might otherwise miss. What could we use to make these, in terms of off-the-shelf solutions? I’ll provide a few, and if you can think of any please let us know in the comments! Wordle: Creates word clouds that can quickly give you a sense of word frequency in a document. While they lack contextualization (you can’t see if people love Elvis at a glance or hate him, just that they’re talking about him, for example), they’re beautiful and very easy to use. I’ve discussed these elsewhere here at ActiveHistory.ca. Maps: From a simple annotated Google Map to more advanced solutions, digital maps can provide an interactive sense of space and time. Tom Peace, who uses maps extensively, draws on “Magic Maps” (providing free Canadian topographic maps) and DIVA-GIS.